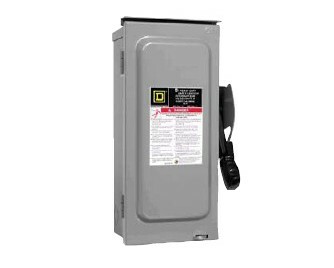 Visible Blades 10 kA Short Circuit Current Rating The Square D light duty enclosed switch is ideal for home applications in disconnecting power to workshops, hobby rooms, furnaces, and garages. Visible blade heavy duty safety switches are designed for application where maximum performance and continuity of service are required. All heavy duty safety switches feature quick-make, quick-break operating mechanism, a dual cover interlock and a color coded indicator handle. They are suitable for use as service equipment when equipped with a field- or factory-installed neutral assembly or equipment grounding kit, unless a 600Y/347 V or 480 Y/277 V, 1000 A or greater, solidly grounded WYE system is used, per NEC 215-10. Heavy duty safety switches are UL Listed (except as noted), File E2875 and 154828 and meet or exceed the NEMA Standard KS1. For UL Listed short circuit current ratings, see page 3-6. Supplied as standard for switching one load between two power sources, and may be field-converted to switch on power source between two loads. Horsepower rated only as footnoted. Download the Schneider Electric Safety Switches spec sheet below or call 714.835.6211 for more information.